Bring a fresh, traditional look into your bathroom with this vanity. The good-looking black granite counter and grey solid wood base make a big difference in your bathroom. Make your bathroom look like new with this good-looking, useful set from Avanity. Use this vanity to bring more modern style into your bathroom. With a black quartz counter and grey plywood base, this product is good-looking and useful. This simple vanity set from American Imaginations will fit right into any bathroom decor. This vanity has both an all-around look and a modern style. 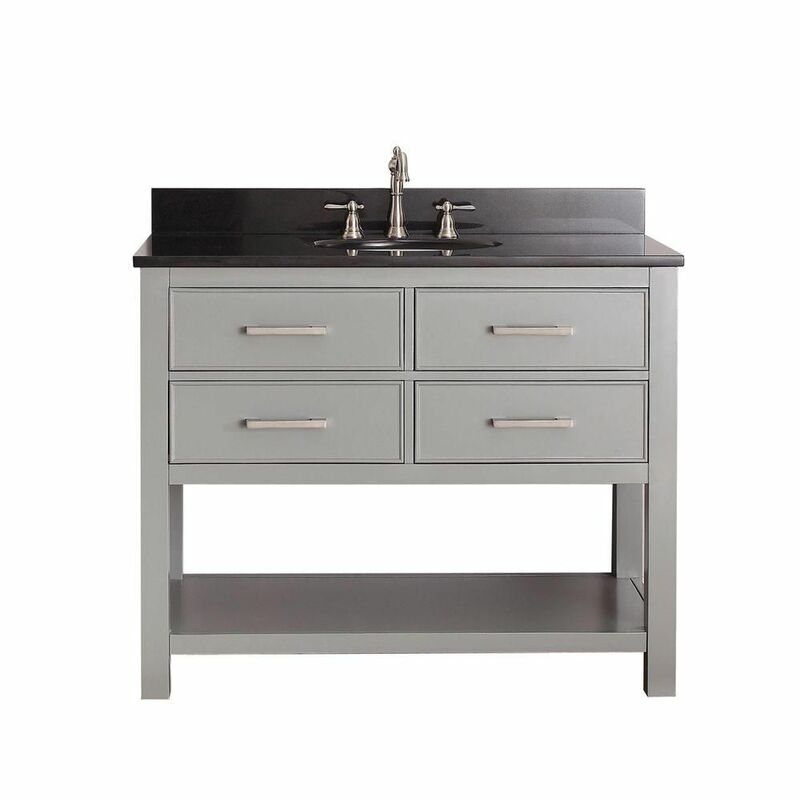 The black quartz counter and grey plywood base make this piece great for any bathroom. This classic set from American Imaginations will make your bathroom look brand new. Enjoy the popular modern look in your bathroom with this beautiful vanity. Its beautiful black quartz counter and grey plywood base bring a great new look into your bathroom. Bring a classic look and feel to your bathroom with this beautiful set from American Imaginations. Enjoy the popular classic look in your bathroom with this beautiful vanity. With a black granite counter and brown solid wood base, this product is good-looking and useful. The simple double-door cabinet is great to keep bathroom items in. Make your bathroom look like new with this good-looking, useful set from Avanity. Brooks 43-inch W 2-Drawer Freestanding Vanity in Grey With Granite Top in Black Bring a fresh, traditional look into your bathroom with this vanity. The good-looking black granite counter and grey solid wood base make a big difference in your bathroom. Make your bathroom look like new with this good-looking, useful set from Avanity. Brooks 43-inch W 2-Drawer Freestanding Vanity in Grey With Granite Top in Black is rated 3.7 out of 5 by 3. Rated 1 out of 5 by Mefraas from Do not buy Avanity product! I have recently purchased This product and cannot be more disappointed. The worst consumer experience I've ever had. Twice the vanity came damaged, and I'm still waiting for a touch up kit from Avanity.